Jurgen Klopp is hopeful Mohamed Salah and Andy Robertson will be available for Liverpool’s make-or-break quarter-final second leg at Man City. 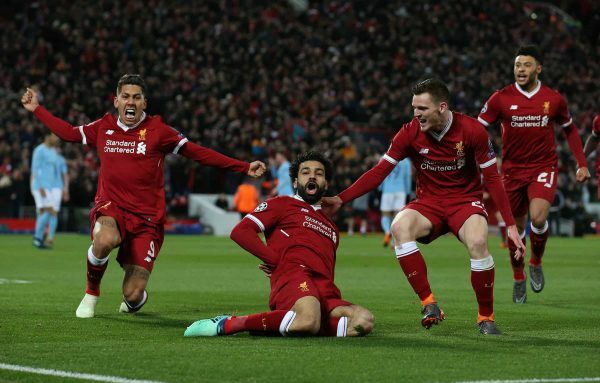 The Reds look to complete the job started so stunningly at Anfield to confirm a semi-final spot and edge growing Champions League dreams one step closer to reality. Despite the three-goal advantage a huge effort will be be required to finish the task, and Klopp’s side will need a professional display to see the job through. After lining up with a patched-up side for the Merseyside derby, Liverpool will be back to as close to a first-choice team as options allow. The good news is that should include Salah, who Klopp confirmed is closer to being ready to feature than not after a groin injury, and the rest of the selection practically picks itself. Providing those involved in training on Monday are all ready to start, the selection picks itself which will see those rotated in the derby and those back from injury all return. At the back, Alexander-Arnold and fit-again Robertson will head straight back to their full-back roles flanking Dejan Lovren and Virgil van Dijk. After a 20-minute derby cameo, the relatively fresh Oxlade-Chamberlain has no choice but to join James Milner and Gini Wijnaldum, who will deputise as No. 6 where he impressed at Everton. 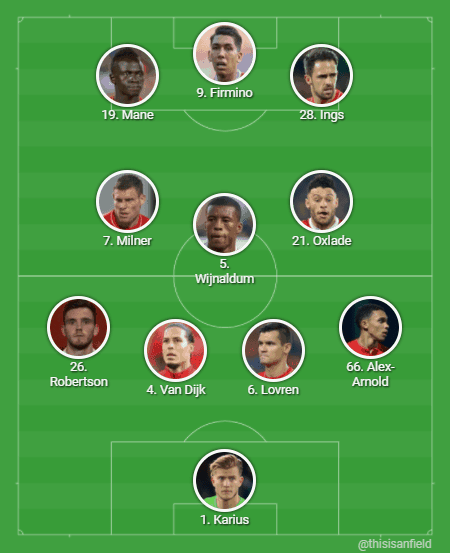 Most crucially, Firmino and Salah will come back in alongside Mane to restore the Reds’ attack to full power on a night an away goal could prove the decisive moment. It may yet prove to be not quite this simple if minor niggles remain despite a strong squad training at Melwood. With Robertson and Moreno both back it’s safe to expect the Scotsman to start and the Spaniard to be on the bench for if and when required. But there was more caution on Salah with Klopp stating how the Egyptian’s final training success will be decisive, so the 38-goal man could still start on the bench. A reshuffle would be needed and there are a few options depending on how ambitious or cautious Klopp wants to play it. Moreno could start on the left of attack to provide a extra security in front of Robertson, as seen in the closing stages of the first leg. But given that scoring would almost certainly seal progression, Klopp may go with a more like-for-like adjustment introducing an attacking option to start. Solanke leading the line flanked by Firmino and Mane is one option but the 20-year-old’s unimpressive derby display should instead see the more experienced Ings preferred. 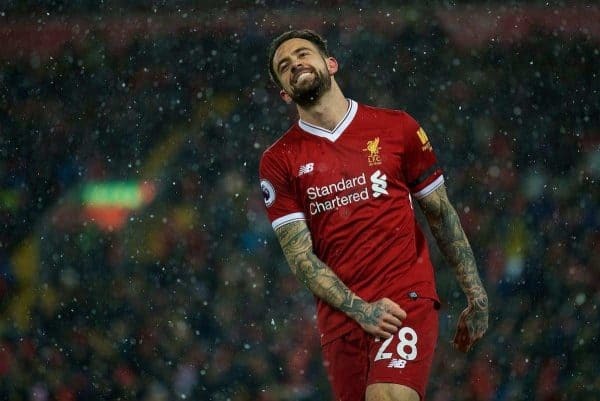 Ings’ greater versatility would be welcome as he could offer a hardworking defensive forward option on the right, which would ensure Firmino stays central. 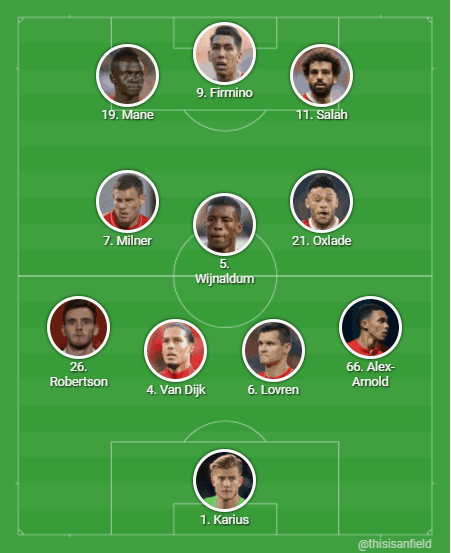 It’s hardly ideal but this could offer Klopp a fall-back option in a crucial clash, with Salah available as a game-changer if required.